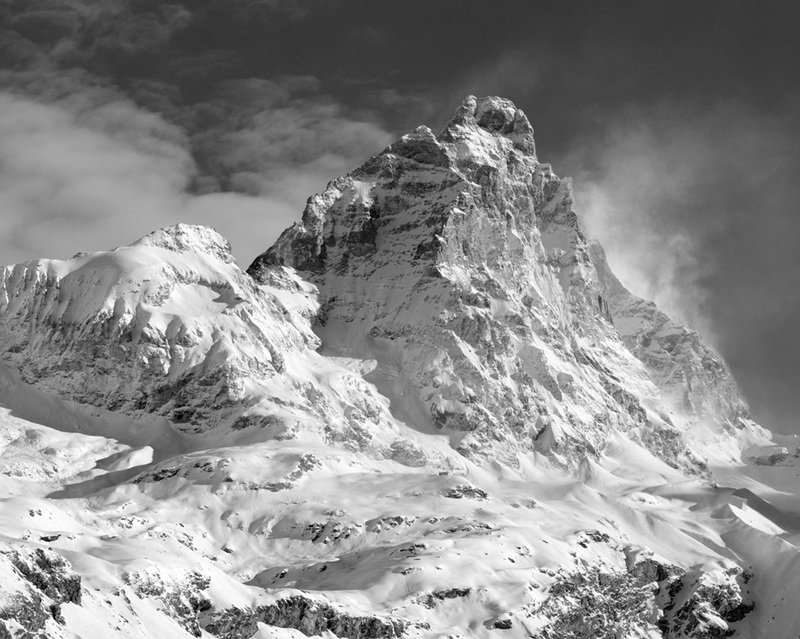 As a mountaineer I never truly loved the Matterhorn and its frail rocks, but as a photographer the perfection of its forms keeps making an irresistible attraction on my soul. I think that the best photograph of the Matterhorn is the one made by Vittorio Sella from Alpe Staffel. It portrays the North face falling dramatically down onto the Zmutt Glacier in late afternoon, wrapped in the soft atmosphere of the upcoming evening. The feeling of power, elegance and mystery coming from this photograph is unique. The first time I saw it I was still a teenager and I was reading the book “Scalatori” (“Climbers”) by authors Borgognoni and Titta Rosa, published by Hoepli. I was completely fascinated by its magical pureness. Looking at the photo I could imagine the Schmid brothers in their tent on the meadows of Alpe Staffel while waiting to try the first ascent of the North face, or the great Bonatti making one of the most legendary solo ascents of all times: the North face in winter. Vittorio Sella’s photo is always present in the back of my mind and its presence keeps haunting me. For many years I longed for making a photo like his, but for some reason or another I never could : no time to reach the base of the mountain, or bad weather, or no ideal conditions on the mountain itself. Last March, after some days of severe weather, the afternoon forecast indicated that there was a sudden window of good weather for the next day. At the end of winter the huge North face is still wrapped up in shadow and “my” photo was not possible to make. On the opposite, the South face was surely beautiful, so I left very early in the morning in order to be in Cervinia just before sunrise. When I reached the plain of Breuil I could see the South face completely iced and frozen and white. The snowstorm up above raised long feathers of snow on the Furggen Ridge, and the Testa del Leone was shining white under the bright sunlight. I had planned to take the cableway to Plan Maison, but I suddenly changed my mind and instinctively stopped my car in a parking lot before the village of Cervinia. I rapidly took out my Linhof 4×5” and started to make photos, one after one, every time with different lenses and different filters. I lost perception of time, as totally absorbed as I was by the perfect light and by the beauty of the mountain: so beautiful as I had never seen it before. In about two hours I used all the black and white films I had with me. The last film was exposed at about mid morning, when the sun was already high in the sky. At that point I decided to go back home, and in the early afternoon I started to develop my films in the darkroom. “Cervino e Testa del Leone, Alba Invernale con Bufera, Valle d’Aosta, Italia” is the outcome of that very special morning. It is a gelatin silver print with size 11×14” (about 28×35 cm) printed by me – as is the case of all my negatives- on Ilford Multigrade Warmtone paper, selenium toned, by a Kodak T-MAX 100 size 4×5” negative. The camera is a Linhof Master Technika 2000 with a a Rodenstock Apo-Ronar 300mm and a light red filter 23-A. The print is mounted on an archive quality board size 16×20” (40×50 cm). I hope you enjoy it as a much as I do, and I hope you can “feel” the luminous pureness of that stormy morning of late winter at the bottom of one of the most marvelous peaks in the world.